UPDATE: Best of the Bank Holiday bargains | What Hi-Fi? As is becoming customary, the forthcoming Bank Holiday will see plenty of retailers vying for your attention. - Home Cinema Store shops in Basildon and Romford also have plenty of discounts to tempt you over the Bank Holiday weekend. There's 50% off the LG 32LD320, now just £199, 35% off Samsung's 3D PS50C490B, now just £500, and 20% off the Samsung LE40C530, yours for £350. There's also 35% off the Panasonic SCBTT350 home cinema system, now down to £280. - Currys. 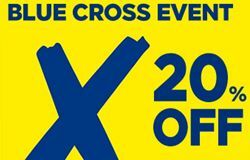 The Blue Cross Event runs until Wednesday June 1st, online and in store, across a wide range of products. You'll find discounts on a wealth of docks and radios, such as the Altec Lansing InMotion Compact dock at £50, the Sony RDP-X50iP dock at £130, and the Pure Evoke Flow internet radio at £160. On the home cinema front, there's the Sony KDL-32EX603 TV at £359, the Philips 40PFL7605 at £900 and the Panasonic DMP-BDT100 Blu-ray player. - Panasonic Store Lakeside. This weekend you can find up to 25% off 3D plasma and LED TVs, plus the offer of free warranties. The real eye-catcher involves the 42in 3D plasma TX42GT30. Yours for £1000, you'll also get a free set of 3D glasses, free 3D Blu-ray player, four free 3D Blu-ray movies and a free 6-year warranty. You'll have to head to the store for that deal, likewise if you want the TXL32E3B for £450 with a free 5-year warranty, or 10% off the TXP50VT30B, down to £2000 complete with a 6-year warranty. - Unilet Sound & Vision is fond of a weekend special or three, and this weekend is no different. The Sinful Saturday Sale sees big discounts on some high-end Leema Acoustics kit at the New Malden store. Included in the sale is the Leema Reference System. Consisting of a Pyxis preamp and two Altair IV monoblocs, it normally costs £21,000 but could be yours for £9,999 on Saturday. There will be plenty more deals on Leema Acoustics kit in store, plus the chance to meet the owners of Leema Acoustics. See our story for more details on this. - Rayleigh Hi-Fi in Chelmsford is holding a 3D event on June 4th-5th (OK, it's not this weekend but we still thought you'd like to know). There will be demos of Loewe's new 46in and 55in 3D Compose TVs, Panasonic's 3D plasma range, incuding a monster 85in TH-85VX200E model, and JVC's X3 and X9 projectors. Customers will qualify for a free 3D Blu-ray player with every 3D TV or projector purchase made at the event, free delivery and installation, and a free HDMI cable up to three metres. - And don't forget the spring sale is still running at Sevenoaks Sound and Vision. We'll be adding to this story tomorrow with more deals – be sure to flag-up in the comments below any bargains that you find.